“I am to say that the Association views this monstrous structure with horror and dismay; feelings which are shared by practically every inhabitant of Rottingdean,” wrote Miss Jayne Seymour to the Town Clerk of Brighton Borough Council. 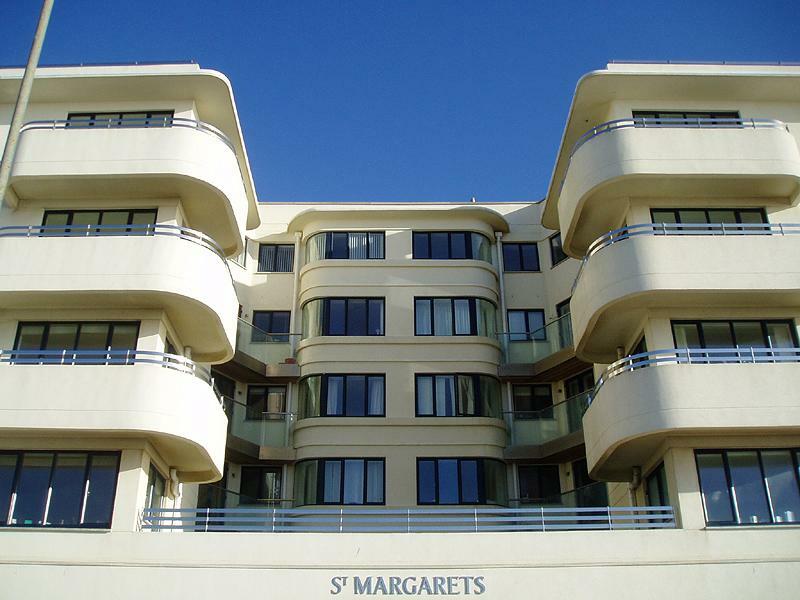 St. Margaret’s is a classic example of Art Deco architecture. It was built in 1938 by Charles Neville’s Saltdean Estate Company to the designs of Richard Jones. Neville was a speculator who dreamed of developing all of the land between Rottingdean and Newhaven. 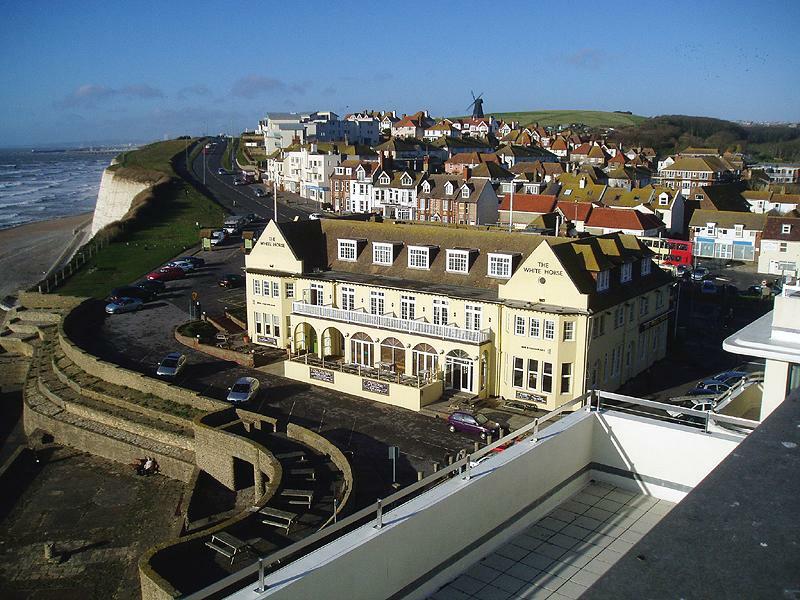 The Estate Company was also responsible for the Lido and the Ocean Hotel in Saltdean; buildings similar in character to St. Margaret’s. Ocean liner-inspired design features include sweeping curves, regimented balconies, gleaming white expanses and, well, views of the sea. Visitors are greeted with expansive Terrazzo floors and then stairs with black and white chequered inserts. The flats themselves have plenty of brass fittings and, in common with many other Art Deco buildings, small box sections along the joints of many of the walls and ceilings which unashamedly cover the building’s steel frame. Rottingdean was listed in the Domesday Book so dates back to at least 1086. It became part of Brighton in 1928 but never really fitted in. Even today, unlike any other council ward in Brighton & Hove, Rottingdean has a parish council. The above-mentioned Miss Seymour formed a Ratepayers’ Association in response to the St. Margaret’s development and rapidly recruited 400 members. The Association evolved into the Preservation Society which continues to serve the people of Rottingdean to this day. St. Margaret’s was declared structurally unsound when it was discovered that large sections of its steel frame were rotten. This resulted in the front of the building having to be replaced. The 42 leaseholders, many of whom own a share of the freehold, had to foot the £2.3million repair bill. The work is nearing completion and it’s clear that it’ll look stunning. I for one am glad that St. Margaret’s was not destroyed by the bomb that fell down the lift shaft without exploding, rather miraculously, during the Second World War. Although, looking back, Charles Neville’s grand development plan seems a crazy prospect, his Art Deco buildings have more than stood the test of time. With the refurbishments of St. Margaret’s and the Ocean Hotel nearing completion, it’ll soon be possible to clearly imagine the opulence, style and workmanship of an era that now seems so distant.